Ok, maybe I’ve been out of the loop because I haven’t read a sizzling romance like this in a minute. I had to stop reading and fan myself a couple of times. This is the first book that I have read by this author, but it will not be my last. I didn’t realize that it was part of a series until I started writing my review so I will be backtracking. Hopefully I can get more Aaro action. Anyhoo, when there’s a strong male character in a story, I can’t help but imagine who they would look like in real life. For some reason, I just couldn’t help but imagining Aaro as Jason from General Hospital. Now if there are any GH fans reading this, they know that Jason is one fine piece of man and fits right into the role. Yes, I overlooked the blonde hair, I was just concentrating on the body so don’t judge me. Nina had a little feistiness about her. She was paranoid as hell, but who wouldn’t be with all she had going on. I liked that she didn’t let Aaro intimidate her no matter how rude or raunchy he was being. I liked him both ways, but that’s just me. It just made their chemistry more appealing. I couldn’t come up with someone for Nina’s character. No, to be honest, I didn’t care. As long as I had Aaro/Jason in my mind, I was good. I loved the story. The romance and the action were on point. The mind reading thing was unexpected and creepy, but it fit right in with the shady characters. It kind of had a paranormal feel to it, which I love so that was an extra bonus. There was never a dull moment so it wasn’t a problem for me to get lost in the story. Overall, I thought this was a good book. I would definitely recommend it to romance and mystery suspense lovers. To win a book: leave a comment on the blog post to be entered to win a book. Be sure to leave your email address in the comments so we can contact you if you’re the lucky winner. This giveaway ends five days after the post goes live. I am already a huge fan of Shannon's stories, and get such a kick out of new readers discovering her work and lovin it. Hi, Cathy! Nice to hear from you again! I'm thrilled about it too. Loving that review, Diva's Bookcase! And congrats on the little 23 day old cutie . . . I just finished Behind Closed Doors and I loved it! I can't wait to read the rest! Thanks for the post and the awesome giveaway! It sounds like a story I want to read! The action will keep me interested as will the romance. I love the McCloud brothers and can't wait to read the next book. So glad you liked BCD, Elizabeth! Good luck on the contest! And I hope you enjoy the book you got, donna! Nice to hear from you again, Na! So pleased that you enjoy the McClouds. Luck to all of you! Thanks for commenting, and thanks to Diva's Bookcase for hosting me! 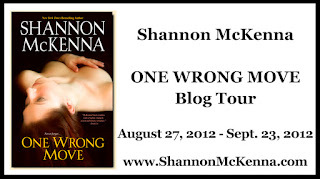 First time to your blog and I really enjoyed reading your thoughts on Shannon's book. I Love the McCloud Series and am looking forward to reading Alex and Nina's story. Thx for stopping by the blog, ladies. Good luck on the contests! I enjoyed the book and was more than happy to participate in the tour. Keep those sizzling romances coming! Great book. This will be my first book. This looks like an exciting story that I would definitely enjoy. I already have all the previous books in this series and would love to win one Wrong Move.